our modern sensibilities. This representative collection of Swift's major writings includes the complete Gulliver's Travels as well as A Tale of a Tub, "The Battle of the Books," "A Modest Proposal," "An Argument Against Abolishing Christianity," "The Bickerstaff Papers," and many more of his brilliantly satirical works. Here too are selections from Swift's poetry and portions of his Journal to Stella. Swift's savage ridicule, corrosive wit, and sparkling humor are fully displayed in this comprehensive collection. 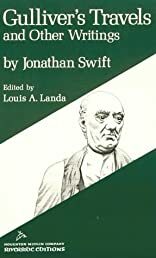 About Jonathan Swift (Author) : Jonathan Swift is a published author of young adult books. A published credit of Jonathan Swift is Gulliver's Travels and Other Writings (Riverside Editions).